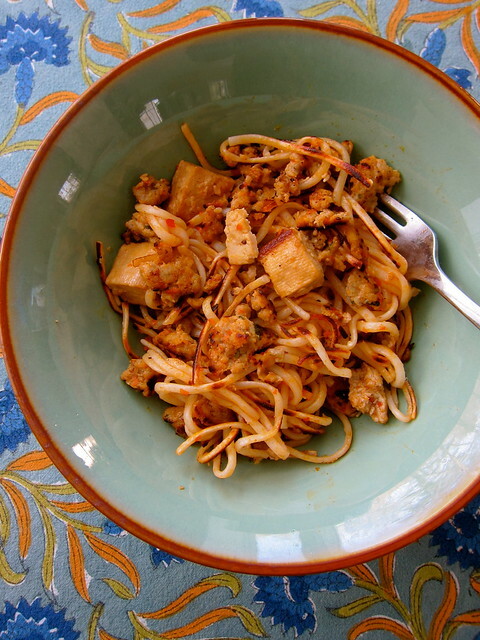 I meant to make longevity noodles to celebrate Chinese New Year’s and, with time running shorter than expected, instead threw together some kitchen staples for a bowlful of pan-fried noodles with curried chicken sausage and marinated tofu — a dish that cooked up so quickly, it almost qualifies as take-out. The noodles are thickish udon, boiled than pan-fried to crisp the edges. Next, a couple of links of Vernon Family Farm‘s curried chicken sausage were removed from their casings, and browned until the meat became crumbly and fragrant. Some baked and marinated Heiwa tofu found residing in the fridge added heft, while a dose of chicken broth simmered with a bit of cornstarch completed the sauce. All it took to finish was a gentle toss with the noodles and a squeeze of Anju’s Son-Mat hot sauce for extra heat. As untraditional as this dish may be, it feels like an auspicious start. Gung hay fat choy, dear friends, may the year of the Monkey bring you many good things.